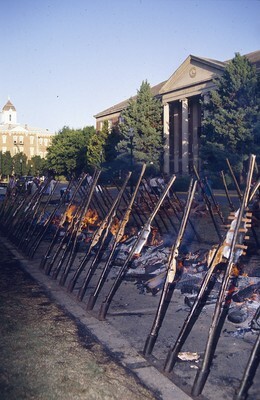 Salmon roasts on alder stakes in front of Melrose Hall at Linfield College during the 1992 International Pinot Noir Celebration. Photo © John Rizzo, courtesy of IPNC. Used with permission. Rizzo, John, "Salmon on Stakes in Front of Melrose Hall" (1992). IPNC - Archival Photos. Image. Submission 44.